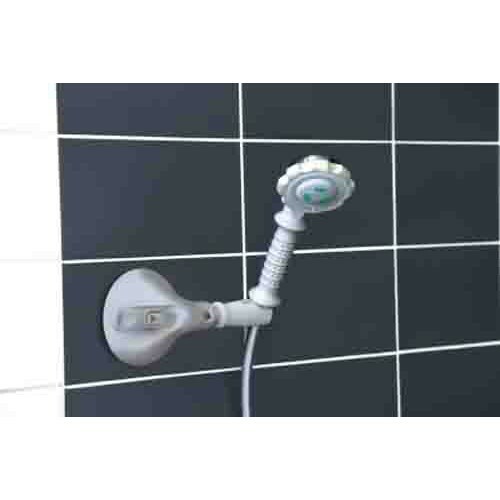 The Mobeli Shower Head Holder with Swivel Arm is a suction cup base with attached swivel arm that will hold a hand-held shower wand at the desired orientation. Choose between one swivel point or two. The single swivel point model allows you to adjust the angle of the stream up or down while the two swivel point model also allows swinging the arm left or right. 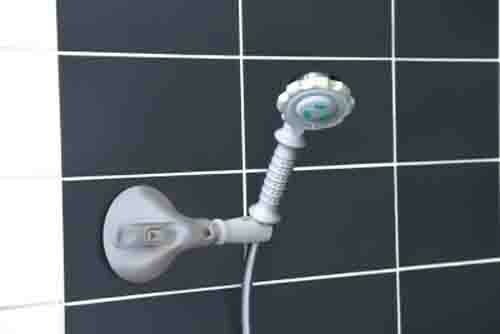 The suction cup can be attached to the shower wall for the best height, whether standing or seated. A hand held shower wand slides into the beveled end and is easily removable for manual use of the shower head. The suction cup base includes an indicator letting you know if the suction is holding firmly or needs to be re-applied. Additionally, suction cup installation allows positioning and repositioning of the handle without the need for tools or damage to property. If you need a shower head as well check out a Hand Held Shower Head with Diverter Valve or the Hand Held Shower by Invacare. Positioning arm with your choice of 1 or 2 swivel points for easy positioning. No assembly required; installs in seconds. Will this stick to a shower stall insert (not tile)? The shower head holder is meant to adhere to any surface, not just tile.